New Zealand Club Class Nationals 2019 from Taupo. January 31; 2 day’s out of 3 till now! Good days as well,… even the invalid first day!!! “Big news today is that Terry Delore is planning to attempt a flight tomorrow from Omarama to Taupo! Apparently conditions are looking good for a crossing of Cook Strait, so there’s lots of eager anticipation here as well as lots of crossed fingers. 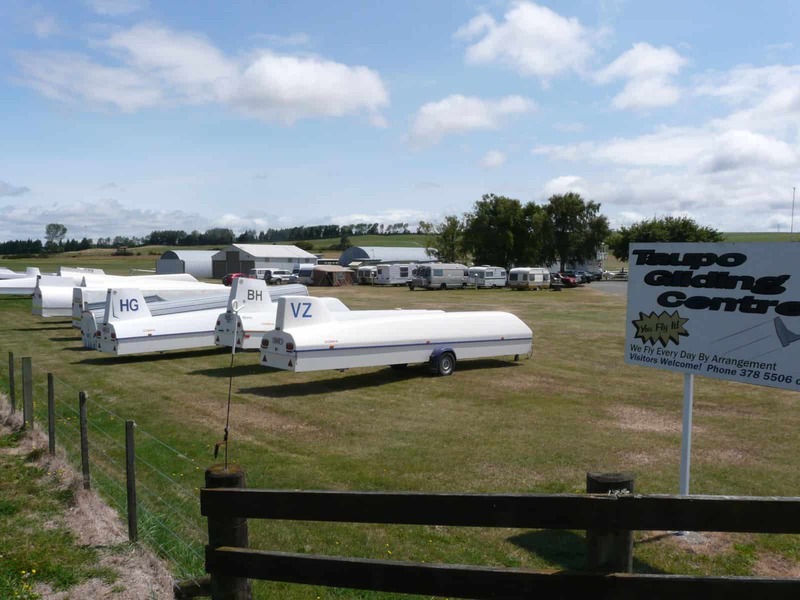 Go Terry!”Written by: Taupo Gliding Club TGC . Club…3 hour AAT; Very challenging for some. Among them the winner from the 2 earlier days Mike [Strathern] He was “out” in his ASW 20. A pity. He was nearly used to 1000 points, now got only 511. 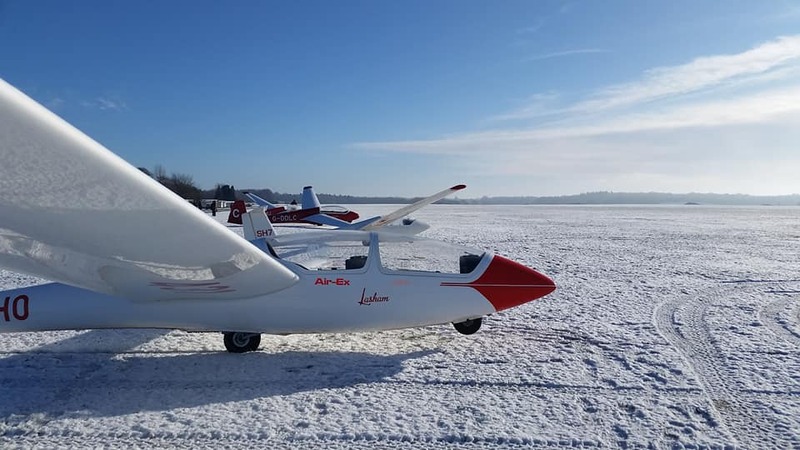 Good day for Tim [Bromhead] in his DG 300, who flew 243 km in time 2.59!!! Steve [Wallace] in the Mosquito was runner up with 187 km. so quite a few less in time 2.50. Combi..3 hour AAT; Maybe it was just waiting for Sebastian [Kawa] to win a day, as that day would come. It was there already on flying-day 3. Sebastian flies with other interested pilots in the rear seat and no secret, these spots sold out straight away. 294 km. in time 3.08 in the DUO DISCUS. Patrick [Driessen] flew around 50 km. less and was runner up. 3 Outlandings 1 of them the ARCUS. 1210. Update on the good news and the bad news; Terry Delore has made it across Cook Strait. 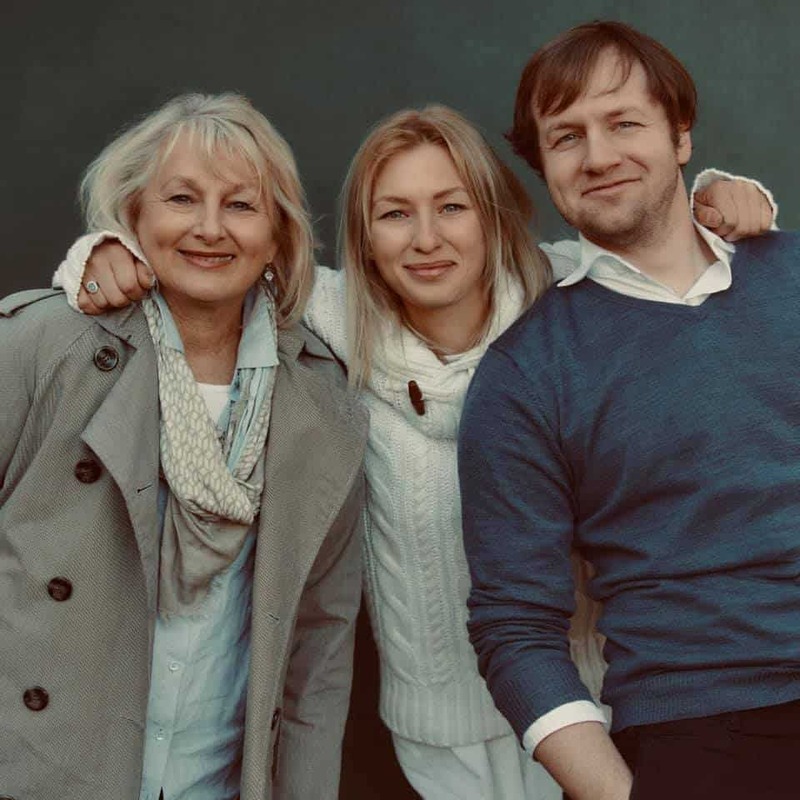 Yay – good news! Bad news is it’s still overcast and barely flyable in Taupo. Contest director says “Hurry up and Wait”. Will do. 1310. We hurried – we waited – the day is cancelled. Terry is abeam Masterton at 14000ft, so if the weather clears we may see him here yet. End good all good, nobody worried about the cancellation.AND,…Terry and his mate specially flew to Taupo, to listen what Sebastian had to say. Club..3 hour AAT; Mike won another day a 1000 points-day[ 291 km. in time 3.23] ! Mark Wilson in the Libelle did well as runner up with 275 km. in time 3.13.988 points for him and the ‘Little” Libelle. Tim was 3d, still 1 overall at this stage. Combi 3 hour AAT; Patrick won the day with 360 km. in time 3.16 and Sebastian was runner up and HE, is already a few days on spot 1 overall !!! BUT,..it ‘s only over on February 9. Club..3.30 AAT; so time enough to fly a few kilometers and they did; Tim flew 331 km. in time in 3.33 in his DG 300, enough 3’s. Steve was runner up and Mike on 3.Mark 4 . So it looks it’s all going to happen for 1 of these 4 pilots. BUT,…still a week to go and a lot can happen. Overall scores after week 1;Tim..4.635. 2. Mike..4.295 and 3. Steve..with 4.257. Mark is also in the 400 range with 4.051!! Combi..3.30 AAT; Sebastian feels more and more at home in N.Z. and managed to fly 455.71 km. in a DUO DISCUS with a speed of 122 km./h. TOP!!!! Keith had 416 km. with 111 km./h. The other DUO DISCUS just started 1 minute later to spot 3 for the day;98.64 km./h. Patrick was 3d as well both had 733 points. Overall scores after 1 week;1. Sebastian..4.841. 2. Patrick ..4.511 3. Keith ..4.474. February 5; 2.30 AAT’s for both classes. Club; 237 km. was flown by Mike in time 2.40 and that meant another 1000 points!! !Tim lost a few points as runner up but is steady going on 1 in the overall scores. Sebastian started at 13.40, raced around over 325 km. in a bit more time [3.08] but was still runner up with 991 points. Speed 103.27 for 103.80!!! February 6; Well deserved resting day with BBQ in the evening. Last day’s in next blog. With 33 participants, the always relaxed-with-a-serious-touch- Horsham -week, started last Saturday in 3 classes. Not the toppers who are always winning, so possibilities for all. Task 1..2.45 AAT; And “mr . SCORES”, Tim Shirley won the day in his ,with 272 km in time 2.46 in his ASW 28. 8 pilots in this class. One “out” by use of engine. Task 2..2.30 AAT; Not “out” by engine this time; Rolf Buelter won the day in his LS 8T with 374 km in time 2.26,…so I quickly looked at the speed, as this was fast. Indeed it was 149.94 km./h!!! All flew over 100 km./h. and Tim did not start, guess he was busy with scores again. Task 4..254 km; after a rest-day due to the weather, they could fly again. 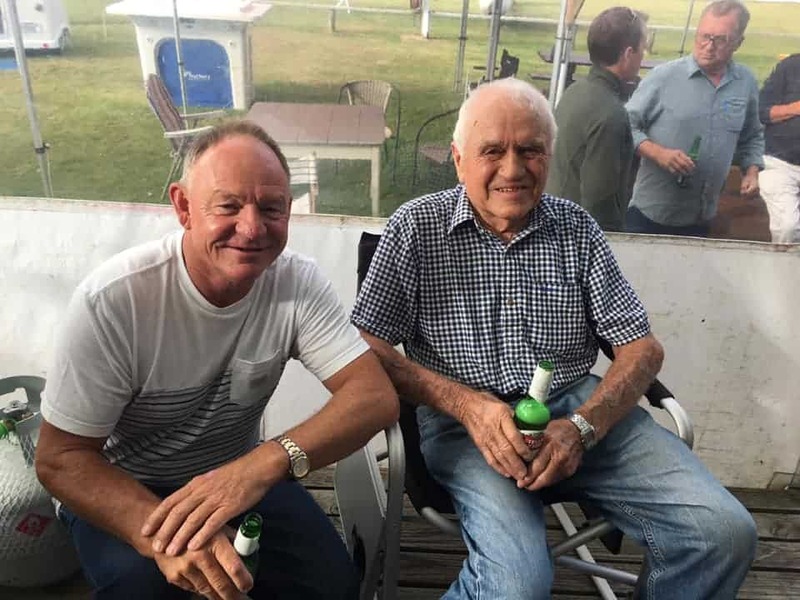 Rolf, a member of the Geelong Gliding club, spending their Christmas often flying in Tocumwal at Eddy’s, won the day in his LS 8T. Not a fast day as speed from finishers was between 87 and 62 km./h. Last one in LS 6 , but… Gordon was IN!!!! Task 1…3 hour AAT; 9 in this class and Pete Buskens in a JS 1 won the day, 343 km in time 2.58; so 114 km./h. Best distance was 405 km. but in time 3.55 by local pilot Arnold Niewand.. Task 2..2.45 AAT; 464 km. in time 2.43 !!! VERY fast!!! 168.84 km./h. WOW. They must have had fun. John Orton won the day in an ASG 29 /18 m. Runner up in ASG 29E/18 m. was Craig Vinall with a speed of 159 km./h, Quite a difference. Diana has a real good practice period for the 2020 WWGC, with 3 comps this season. She flew around with 139 km./h in her Discus CT/18m and was 5th. Task 4..234 km; He started as last of the 10 pilots and won the day again ;John in his ASG 29/18m. Though the expectations for the day were not so high, it turned out a pretty good day. Rolf mentioned that it was a difficult, low, slow, blue day. Runner up was Michael Durant in his Jantar 1 and Diana was 3d. Task 1.. 2.30 AAT for the 13 pilots and Jaroslaw Mosiejewski won the day in his PIK 20B; 255 km. in time 2.32. Jaroslaw flew with the Geelong Club in Tocumwal this season and had some great flights. One flight even 959 on Dec. 27!!! Task 2.. 3 hour AAT; 375 km. for Craig Collings in his ASW 20 in time 2.53 with a nice speed of 125 km./h. Task 4..172 km; Daily win again for Jaroslaw with Craig as runner up. 4 Out-landings. 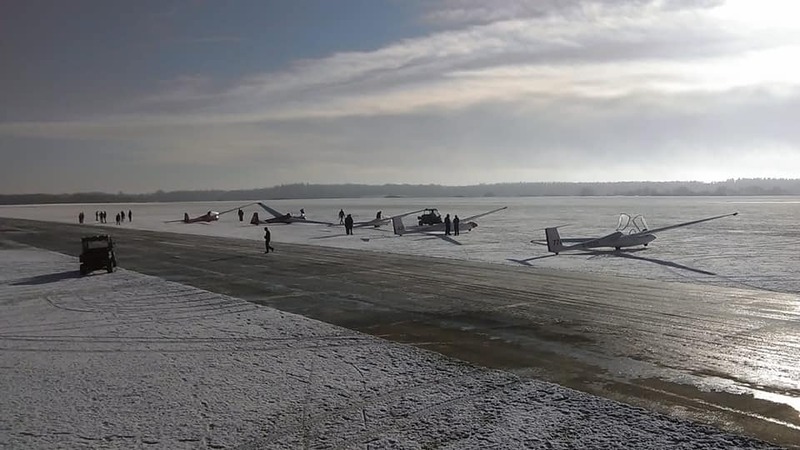 No flying today …..and what happens the rest of the week , you can read next week. In Holland women started on January 25 2019 a Foundation for Dutch women in aviation. It’s for all kind’s of aviation of course including gliding, as support for what they are doing. —-And to finish,…it’s COLD!!!! Not only here but at a lot of places.I guess the MIDWEST in the USA has the worst circumstances with up to minus 40 , …with the windchill factor up to minus 60!! !…the coldest EVER and already 21 people died,from cold and by accidents on the road!!! I read somewhere that the difference in temperature between Australia where it was extremely hot , up to 49 in the Adelaide area, and the USA was over 80 dgr. C.
People in Australia really suffer either from the many heat-waves creating one of the worst drought’s or flooding in the NE, where Townsville is under water!! Even N.Z. was hot, with up to 32 dgr. C.!! !That’s not normal either. 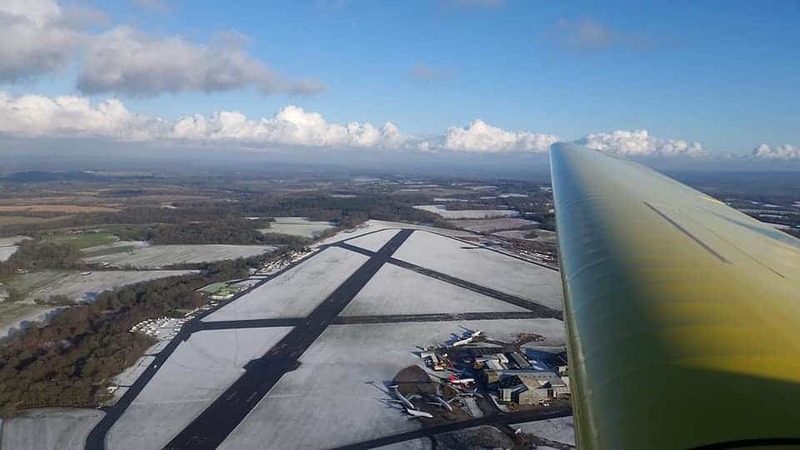 Lasham in the UK, shared these wonderful winter-season-pictures !! Photos by Matt and Jordan. CU next week it’s nearly March again and spring starts. Last Sunday we really had a nice but very cold day [around 0-2 here] with 6/8 of cu’s. When I looked at the news in the evening the weatherman shared great radar pictures from cloud streets. A few pilots even dared to fly local and loved the visibility.